The War Memorial was originally erected to commemorate those who served in World War One. 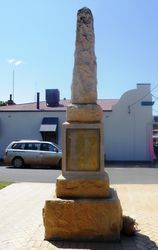 In 2005 the Beverley Returned Services League proposed a plan to upgrade the area surrounding the War Memorial, a project that was completed in time for the 2006 ANZAC Day Remembrance Service. Since the 2006 ANZAC Day ceremony the Beverley RSL has made the new brick wall behind the memorial.. The memorial consists of five sections of cut stone and is approximately ten feet high. On four sides are brass plates inscribed with names of Beverley residents who served in World War One. 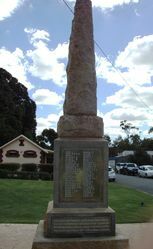 Erected by the people of the Beverley Roads Board district to perpetuate the names of the gallant men who offered their services and left Australia to take part in the Great War of 1914-1919 for Home and Empire.